I live in Calgary, a short hop from some of the most beautiful scenery I have ever seen and I like to take as much advantage of it as I can. I am very much an out-doors kind of person who loves hiking whenever I get the chance. When not doing that, I enjoy reading, cooking, playing computer games, knitting and sewing and I am also a massage therapist with 2200 hours of training and a Reiki Master. I am also training as a Clinical Aromatherapist via Essence of Thyme and a Holistic Nutritional Consultant via the Canadian School of Natural Nutrition. 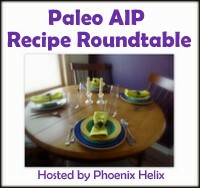 I have both celiac disease and an anaphylactic dairy allergy, and for that reason, I follow AIP with some reintroductions. I also suffer from fibromyalgia, PTSD, anxiety and depression as a result of domestic violence and childhood abuse. Following this way of living and this diet has dramatically improved my health and my sense of well-being. I would like to think that I am now thriving rather than merely existing. I have a background in nutrition (a degree in Nutrition and Physiology and a PhD in Nutritional Biochemistry) and am passionate about good food and good nutrition and the way it can impact your health. And with my love of cooking, that is what I am trying to share on this blog. In the past, I have been asked about the origins and the reason for the name Salixisme – the long and the short of it is that way-back-when, I used to be a hard-core gamer, and my gaming name was Salix. When I first started this blog, I was trying to think of a good, catchy name, and came up with Salixisme… It literally means Salix Is Me! Salix is the Latin name for Willow BTW. That is not really a deep and meaningful explanation, but it is the truth! Was looking for a shrimp curry recipe. Traveled through a few and saw your comment on one–followed that lead to here! Thanks for all the great looking recipes. Enjoyed reading your “About.” I’m an MD (although I chose to stay home two years ago to homeschool my three daughters) who is also embarrassed about how I just never stopped to put it all together–I knew what I needed–but was either too busy or too busy following guidelines–to apply it properly to nutrition. I’m thankful now to know even though I no longer have patients to “practice” on! I’ve got myself and my family–and we feel great! I have no idea if date sugar would work, I have never tried it – sorry about that. I do know that you need a fermentable sugar to feed the yeasts and bacteria in the Water Kefir grains (so stevia and artificial sweeteners will not work). Date sugar is mostly fructose, so you might get less than optimal growth of the kefir grains, but I am just guessing at this point. I tried coconut palm sugar (again high in fructose), and that did work, but the health of my grains suffered and they became mushy and small. Maybe you could use date sugar for some batches and organic, unrefined cane sugar for some to allow the grains to regenerate. Thank you. When I try this, I will stick with the regular sugar. I am thrilled to find your blog! I have Lyme disease along with too many other things to list. I have started making homemade bone broth and am super interested in trying organ meats. I have ordered a Lyme Diet cookbook and was looking for a Paleo recipe source that incorporated the organ meats. Looks like I have to search no more!!! Thank you for your blog! Thank you for your adventuresome nature! From the descriptions you gave about your family’s nutrition, I’m guessing you are doing a ketogenic diet? Just curious because I’ve been “paleo” for 2 years and have not lost a single pound, nor do I have any energy. I do eat a small serving of sweet potato daily because I have Hashimotos and was told that people with autoimmune diseases should not go VLC. Otherwise my nutrition is very clean, few berries this time of year, no other fruit or starch and no alcohol. Just cannot figure out why Paleo doesn’t give me the positive results it does so many others. thank-you for your message – I probably need to review the “about me” because we eat so far from keto it is unreal! Hubby is the only one who is remotely low carb, and that is because he needs to loose serious amounts of weight, but is also epileptic and has found that low carb/keto helps him (he does cheat a lot though!). The kids are very definitely not keto – they eat loads of carbs (kids need it tbh), they add potatoes as they tolearte them well along with rice and all the root veg that I eat. – they also eat dairy which I cannot eat due to an anaphalactic dairy allergy. The one thing that no one in our family eats is gluten containing grains. If you look at most of my recipes, the side dishes I serve are mostly root veg/carb dense. Hubby does not eat them, I eat enough to satisfy me and the kids devour the rest. I agree that people with AI diseases should not eat low carb unless there are other indications to make it advisable (epilepsy would be one of those) – for me it was a bad thing, and it did adversely affect my health. since I have upped my carb level I have been feelign better. I thinkg the one take home message you need is that there is no one paleo diet that works for everyone – our family has been tweaking ours for the last couple of years. hubby needs low carb, I need some carbs, kids need lots of carbs and some dairy – play with it and work out what works for you. And I will update that “About” as we don;t eat ketogenic and never really have except for hubby and me briefly. How did you come up with your blog title and what does it mean? Thanks for sharing your great recipes.